It is well known that light can be amplified by stimulated emission e.g. in laser crystals. In a laser crystal, additional effects such as gain saturation, gain guidingand diffraction also come into play. But how do all these effects combine in detail? A clear quantitative understanding of such processes is indispensable for the efficient development of laser devices. Figure 1: A laser beam in a laser resonator. Numerical simulations can reveal how exactly the amplification process works, how strong is the effect of gain guiding, whether higher-order modes will be excited and spoil the beam quality, how the laser reacts to misalignment, etc. The laser crystal is assumed to contain laser-active ions with a certain doping concentration. The internal working of the laser-active ions can be described with an energy level scheme and rate equations, containing parameters like wavelength-dependent transition cross sections and an upper-state lifetime. 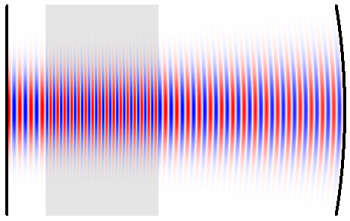 The laser beam is described by complex field amplitudes on a numerical grid which spans the laser crystal and possibly also other optical components (in some cases, a whole laser resonator). A suitable software such as RP Fiber Power can numerically simulate the beam propagation through the laser crystal (or in many round trips through a laser resonator), taking into account stimulated emission, diffraction, gain guiding, saturable absorption, etc. (Of course, the user of such software does not need to deal with the details of how such things are calculated.) As an example, see a case study on an actively Q-switched laser. Simpler models assume a fixed transverse profile of the laser beam and effectively propagate only optical powers rather than full beam profiles. They can be processed much faster, but only if one knows that beam profiles are not significantly affected e.g. by gain guiding effects. In many cases, transverse beam profiles can be considered as totally determined by waveguide properties only. This greatly simplifies the propagation, because simple power propagation is sufficient (see our tutorial on modeling). In most cases, quasi-three-level laser transitions are used, where one needs to take into account reabsorption effects. The optical intensities are often very high, causing strong gain saturation effects as well as nonlinear effects.